I first read The Fault In Our Stars two years ago and as the film is due out in weeks I wanted to re-read it before going to see the film and so I could review it. The Fault In Our Stars follows the life of Hazel Grace Lancaster who suffers from terminal cancer whose hold has been reduced due to a miracle drug. She goes through her life day by day but when she walks into a Cancer Support Group to appease her mother her life changes. There she meets a gorgeous boy called Augustus Waters and they embark on a beautiful tale together. I absolutely love the way this book is written and the way the story is told. TFioS made me laugh, made me cry and made me sob. I sobbed my heart out reading this book, but I throughly enjoyed the story it told. 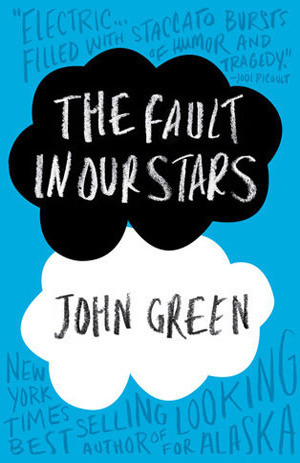 It would be very easy for this book to become very heavy, but it doesn't, Hazel and Gus make sure it isn't like that. Hazel and Gus both have so much fun and that's what stops the book being too heavy. You see them fall in love in front of your very eyes. There are moments when Gus is so very swoony and I love him for it and he is just what Hazel needs and didn't even know she needed until he was there. They support each other and help one another by just being there and they are so similar it's ridiculous, it's like they're made for one another. "You gave me a forever within the numbered day, and I'm grateful." This quote for me sums up Gus in TFioS. This what he is doing for Hazel and she didn't even know she needed it. He gave her the forever she thought she would never have. And then there's the twist, the gut-wrenching twist. There's one particular scene, set at a garage that I couldn't read without sobbing. It was so raw and emotional you could feel both Gus and Hazel's pain. All in all, I love this book. It is amazing and so worth a read. I can't wait to see it on the big screen in a few weeks time.